Woodland caribou, true to its name, prefers forests to tundra. For their winter survival they depend on the kinds of lichen that only grow on very old trees. Habitat loss due to logging and other threats diminished woodland caribou numbers across the North American continent, and the only place where it can be legally hunted is the Canadian province of Newfoundland. Woodland caribou hunts start at about 10,000 USD. As a large part of the price comes from the cost of travel to remote areas of Newfoundland, it’s advisable to combine woodland caribou hunting with hunting other species such as moose. Combination hunts typically are a better value. When to hunt Woodland Caribou? Resident hunters prefer to hunt caribou either in the early or in the late part of the season, because the flesh of an adult bull during the rut may be unpalatable. Hunters who would like to harvest a bull with antlers in prime shape, however, would have to time the hunt after the bulls get their antlers out of the velvet stage and before they drop the antlers after the rut. Woodland caribou hunting is said to be more predictable than tundra caribou hunting, because this species does not typically do large scale mass migration. Still, caribou are constantly on the move, and spot-and-stalk is a very active pursuit that will take the hunter for many miles across the woods, meadows and bogs. The alternative method is to predict the motions of the herd and ambush it. Successful guides often combine the two methods. Newfoundland and Labrador woodland caribou can weigh between 350-500 pounds, and mature bulls may tip the scales at some 700 pounds. They carry large and impressive antlers that are typically semi-palmated and resemble those of the fallow deer. In addition to these trophies, which are for a true hunter only material symbols of the challenge of the hunt, a great attraction for woodland caribou hunting is the feeling of being in the middle of nowhere in the unspoilt wilderness, among crystal clear lakes and primal woods of the province. We offer week-long guided moose - caribou combo hunts from our Newfoundland hunting camp located at Chucks pond. Our most common method of moose hunting is spot, stalk and calling. Newfoundland’s big game hunting season opens on the second Saturday of September. The moose number in our province are between 120,000 and 150,000 animals, with mature males weighing between 1000 and 1500 lbs. The rut begins throughout the last week of September (prime time) and into much of October. It is a Remote fly in hunt and the purchase of a hunt includes the following. Travel within Deer Lake (ie. airport pickup/drop off, meat and trophy deliveries to butcher/shipper, to/from float base, last minute shopping needs) Float plane flights to/from camp for hunters, gear, meat & trophies 7 nights at camp, all meals, field lunches, full bath with hot & cold running water, generated electricity, woodstove 6 days guided hunting Field preparation of meat and trophies (caping) Equipment use in the field (boat, quad, etc.) 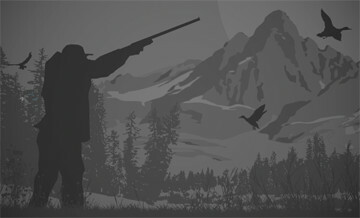 The combo hunt price is $10.000+licence $765 A bear tag can be combined with any of our hunts. Once the bear is harvested a $500 trophy fee will be applied. Bear hunts are not baited and are incidental while hunting for moose or caribou. Non-hunters are also welcome at the lodge at a rate of $2,500 per person. Please inquire for available dates.